Pelayanan Medis Nasional: Now What? In the midst of an uncertain world, we may long for the certainties of job, income, professional growth, and work relationship --- but those are just superficial. The true certainties our hearts long for run much deeper. So, in an uncertain world, what can we count on? In the most ancient book in the Bible, a man named Job learned firsthand the pain of loss. He lost his children, his possessions, and even his friends. Such a magnitude of loss would be devastating, but Job didn't see it as surprising. His testimony shares the stark reality of living in a fallen world. Job said, "How frail is humanity! How short is life, how full of trouble!" (Job 14:1). It's not necessarily true that we are being singled out or facing something out of the ordinary. Difficulty is to be expected because life is troubled. If we feel that we are isolated in our circumstances, we've lost sight of the most critical certainty of all --- God is still there, even when the bottom drops out of the world. In Hebrews 13:5-6, we read: "Don't love money; be satisfied with what you have. For God has said, 'I will never fail you. I will never abandon you.' So we can say with confidence, 'The Lord is my helper, so I will have no fear. What can mere people do to me?'" 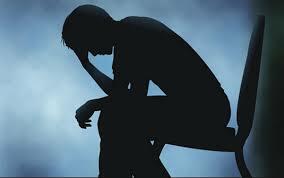 When life becomes overwhelming, there's nothing more important than knowing that we don't face those burdens alone. God is there. We have resources beyond ourselves. In Matthew 6:33, Jesus spoke to people who were fearful. They were also uncertain about how they would live and how their needs would be met. Jesus wanted them to look higher, when He said, "Seek the kingdom of God above all else, and live righteously, and He will give you everything you need." It may be that the pressures we feel are a result of pursuing the wrong goals. A right relationship with God is significant because of who He is, and because a relationship with Him is the one thing in life that lasts forever. In Him, we have an eternal supply that this world cannot destroy. Our pain can grow our faith. "We now have this light shining in our hearts, but we ourselves are like fragile clay jars containing this great treasure. This makes it clear that our great power is from God, not from ourselves. We are pressed on every side by troubles, but we are not crushed. We are perplexed, but not driven to despair. We are hunted down, but never abandoned by God. We get knocked down, but we are not destroyed. Through suffering, our bodies continue to share in the death of Jesus so that the life of Jesus may also be seen in our bodies" (2 Corinthians 4:7-10). If you know Christ, you can be assured that you serve the God who doesn't waste anything --- including the pain of job loss. Our pain can help others. Not only can our struggles help us to grow, they can also provide an opportunity to help others. Our experiences can give us the background to help others when the pain of job loss visits them. To that end, Paul wrote: "All praise to God, the Father of our Jesus Christ. God is our merciful Father and the source of all comfort. He comforts us in all our troubles so that we can comfort others. When they are troubled, we will be able to give them the same comfort God has given us" (2 Corinthians 1:3-4). We are never so well-equipped to help hurting people as when we ourselves have experienced pain and loss. Then we can take God's encouragement and share it with others. When we face a serious life crisis, like losing a job, it can seem like the end of the world, that life will never be good again, and that there's nothing left to live for. Be assured, however, that it's not the end. Paul wrote: "Yet what we suffer now is nothing compared to the glory He will reveal to us later" (Romans 8:18). Whatever dark experiences we face in this life, one day they will be overwhelmed by the perfect and complete reality of eternity in the presence of the Christ who loves us and gave Himself for us. When we're going through seasons of trial and hurt, it's easy to question whether God loves us at all. The experience of loss, however, is not capable of disrupting His love for us. 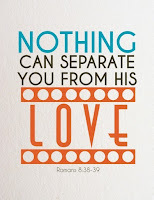 Paul wrote: "I am convinced that nothing can ever separate us from God's love. Neither death nor life, neither angels nor demons, neither our fears for today nor our worries about tomorrow --- not even the powers of hell can separate us from God's love. No power in the sky above or in the earth below --- indeed, nothing in all creation will ever be able to separate us from the love of God that is revealed in Christ Jesus our Lord" (Romans 8:38-39). Separation from a job is a crushing, heartbreaking event. It is not, however, what matters most. 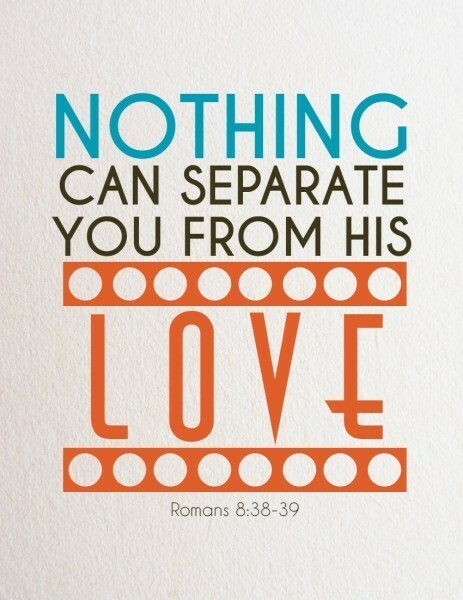 Nothing in all the universe can separate us from the love of God --- and that does matter the most! Now What by Chuck Fridsma. Adapted from Now What? 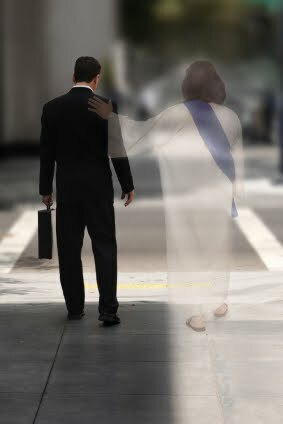 The Healing Journey Through Job Loss, 2009. RBC Ministries.